Hiking can actually get quite expensive if you don’t know what you are looking for or you fancy expensive products, but going with an entry-level pair of hiking boots in the beginning, can keep your costs down and your feet comfortable out on the trail. It is necessary that you have the right kind of shoes to enjoy such a hobby safely and you should also note that with the right footwear, your feet and ankles will have the support they need so that you are not in pain while spending time outdoors. Going out on a trail with the wrong shoes can be catastrophic. There is a variety of choices of hiking boots to choose from and making sure that you get the right ones can seem like a complicated process, especially if you are buying them for the first time. We have narrowed down the list for you below and whether you’re looking for men’s hiking boots or women’s hiking boots you will be able to find the perfect boot for your next adventure. Buying cheap hiking boots can be risky, as you need to filter down whether the boot is comfortable, durable, or of high-quality so that protect your feet when covering the rugged ground. Therefore, to help you choose the right kind of boots for you under $100 for both men and women. Before proceeding directly to the list, you should first know the points to consider and then go out to buy the best model as per your requirements. The first thing you need to do is determine what you’re going to use them for. This is very crucial in buying the right kind of boots for your feet. It mainly depends on whether you will be hiking on even and well-maintained trails carrying a light pack or the trails you will be hiking on are more challenging with rough terrain and you are carrying a heavy backpack with you. Noe for the smaller and non-challenging trails, a low to mid-cut hiking boot will be rendered adequate to provide you the needed protection. On the other hands, with the more challenging trails, a higher top hiking boot is recommended to get you to safety on those rocky and uneven terrain. One of the most important parts of choosing hiking boots is to make sure that they fit your feet perfectly. The fit should be such that the boot should fit you snugly, but not be tight. For a comfortable and pain-free hiking experience, it is crucial that you buy hiking boots that are the right size and fit. Once you find the right fit and size of the boots, it will be convenient for you to be very comfortable during any lengths of trails you might want to go on. You should always carry in your mind some do’s and don’ts while trying on a pair while choosing the size and the fit. Always try on the shoes to check the size and fit and not just give it an overall look of consent. Always wear the socks you will wear while hiking when trying on the shoes. All the brands do not have the same sizes and fit and so always check the right size and don’t try to stick to the same size you always wear. The material from which a pair of hiking boots is made is also important for having a happy trip in the wilderness. The material should be breathable, waterproof, sturdy, durable in order to withstand the wear and tear that comes with strenuous outdoor activities. Hiking boots are made from various materials. Most boots under $100 come in either leather or synthetic materials. The leather is and will be heavier than the synthetic material and will also breathe less. But being leather, it will definitely be more dependable, water-resistant, especially in bad weather. There are three types of leather boots you may come across, full-grain, split-grain, and nubuck. Synthetics will be lighter and more breathable, cheaper and lighter, but can break down faster. The two most common synthetic materials used are nylon and polyester. and more breathable than leather. Many hiking shoes use a combination of leather and synthetic materials to take advantages of the benefits of each of these materials. Hikers and backpackers’ lovers can go hiking in any kind of weather, be it snow, rainy, sunny and what not and can also cover any form of terrain, be it rocky or uneven or dry or wet or natural water areas. You never know what goes into the minds of hikers, when they are about to go on a hike and therefore you need to be prepared for everything. One of those things is water resistance of the boots you will be wearing on the trip. Always check for the same thing when you are about to purchase a pair of boots and the time it takes to dry off completely even in small streams or rivers. When it comes to long hikes, you do not want sweaty feet and so, breathable materials used in the construction of the boots can allow moisture out without allowing water in. Ventilation and breathable materials will prevent your feet from becoming too hot and sweaty and the hike will seem more comfortable and enjoyable when your boots allow the right amount of air flow between the feet and the sole. Therefore, always check the breathability of the boots before you purchase them. The Timberland White Ledge Men’s Waterproof Boot is the big shot you should call in when you need a durable boot that not only looks good but can also stand up to the roughest outdoor terrain. With the Timberland ankle boot, your feet will stay completely dry and is the ideal choice for any type of outdoor weekend or day hikes. They are also padded for providing you with additional comfort and a snug fit for ankle protection in uneven or rocky terrain. To be specific, these boots are padded in the collar and tongue of the boot to offer additional ankle support and that you don’t have to worry about wet feet all along. The boots support an EVA footbed in a dual density, a removable component that allows air to circulate through the perforations to wick away the moisture from the feet to keep them dry and cool. These boots feature a BSFP traction and support system that stands for Brake, Support, Flex and Propel. Rubber soles are crafted with a lug design that grips in challenging conditions, helping you make carefree movements. The gusseted tongue design in the model helps to relieve pressure from boot laces, while also keeping trail debris out of boots. 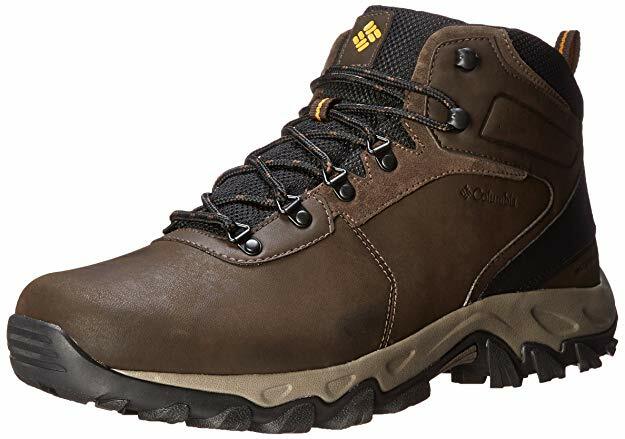 These hiking boots have a premium full-grain waterproof leather upper, with seam-sealed waterproof construction, and rustproof speed lace hardware with hooks at top for secure lacing. Overall, the boots will provide you with amazing gripping power in mud and slippery surfaces and help in keeping your feet dry in rugged style, these leather hikers take on any terrain and look great with your performance hiking gear and with jeans and a tee. The Keen Men’s Targhee hiking boots are the mid-cut boot for men you should look for that will keep your feet cool and dry in inclement weather. The special contouring in the boots provides the ultimate traction at the heel for added safety on rocky or slippery surfaces. The design and construction of this lightweight boot allow you to walk for extended hikes without any tiring feet. It has a low-profile upper with ghillie lacing for a comfortable and secure fit, this model also features a breathable leather lining that allows air to flow in and out to keep your feet cool and dry. The boots come with waterproof leather and a textile fabric with a rubber sole making it highly resistant to light rain and other types of moisture so that your feet will stay dry for a more comfortable hiking experience. The 4mm multi-directional lugs and heel lock add greater grip to lessen the chance of falling. Padding in the tongue and collar offer greater comfort and less chance of rubbing or blisters. This is a pair of lightweight boots that are easy on the back for longer trails. This boot style is running a 1/2 size small and therefore we will suggest you order a 1/2 size larger than your usual size to avoid any last-minute exchanges. The Targhee Mid II offers you a four-wheel-drive performance for your feet. The ESS shank provides torsional stability for a secure ride, while the mid cut height increases ankle support through canyons and over mountaintops, making this quite an option to select. With the Merell Moab 2 Gore-Tex boots, your feet will slide into a reminder of what has made these shoes so popular for so long. It is truly comfortable right out of the box with a cushioned collar and tongue, supportive footbed, and enough flexibility to take straight to the trail. The GORE-TEX technology used in the construction of the boots provides a waterproof membrane with exceptional breathability and waterproof performance, to keep your feet high and dry all along the expedition. Bellows, a closed-cell foam tongue in the boots help keep the moisture and debris out, providing additional comfort. The Merrell M select FIT.ECO + blended EVA contoured footbed comes with an added zonal arch and heel support for added safety on rocky or slippery surfaces. It also has a protective rubber toe cap and a breathable mesh lining to keep the boots dry and in turn your feet safe from any moisture. The Merrell air cushion in the heel absorbs shock and adds stability to the boots to enable utmost feet security. Therefore, this is the option that you should put your money on if you want quality and worth of money at the same time. The Columbia Men’s Newton Ridge hiking boots offer a richness of leather with natural support with high resistance to moisture. The boots also sport arch support, flexibility and strong gripping traction soles for maximum safety. The high leather uppers measure five inches from the arch of the boot for maximum ankle and foot support. The Techlite midsole in the model offers a high energy return for each step, keeping your feet less tired for a longer haul. The rubber sole on the boot features an Omni-grip patented traction rubber that grips your feet well while being resistant to leaving black marks on floors. The lace-up closure allows you to wear the boots with a secure fit and the shaft measure approximately five inches from the arch. It is built from lightweight materials like leather, mesh, suede, and metal that are coated with UP for maximum resistance to water and other types of moisture and also keeps the weight of the boot at the minimum. The addition of waterproof seam construction seals the moisture out to keep feet cool and dry. The extra comfort that you will feel from well-placed cushioning to guard against friction points for a more comfortable wearing experience. 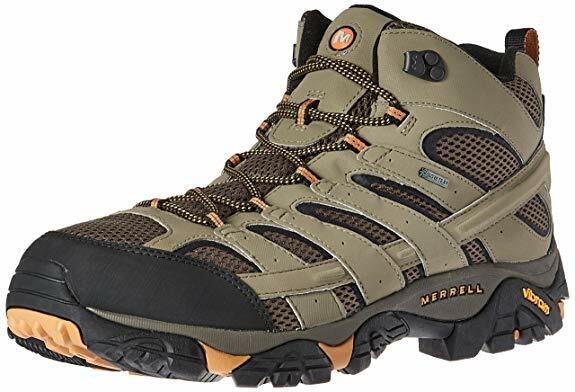 This model makes hiking a comfortable thing for men while providing quality and comfort to the boots section of the camping gear. The Danner Men’s Radical GTX waterproof outdoor boot is the one that will resist moisture with the help of Gore-Tex materials for one hundred percent protection from any rainy or dewy trails. You will feel the comfort all day long as you trek through puddles or small streams. The leather and fabric materials used in the construction of the boots are complemented with a breathable lining for good air flow that helps to prevent foot sweating. 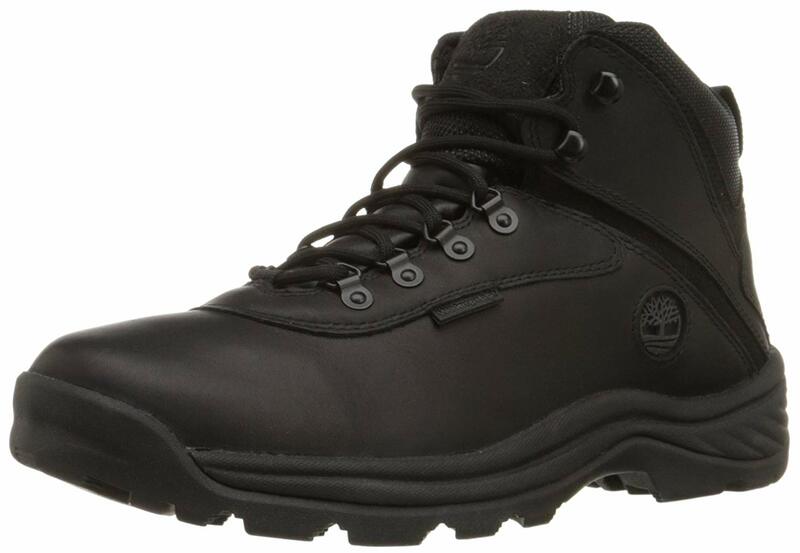 The model also offers you with leather upper and 1000 denier nylon, along with the abrasion resistant toe cap make this a sturdy and durable boot adding up to the life of the dependable model. The additional nylon fabric and nubuck leather materials are combined to present a lightweight that is suitable for moderately challenging hiking situations. The addition of Thermoplastic PU shank is an additional defense system loaded inside the boots to provide protection against moisture. The use of the Terra Force platform is a part of the design that adds stability and lightweight performance to this comfortable boot. These are a great pair of boots that are durable and long lasting that can bear the abuse of nature. The Keen Koven shoes are a brand dedicated to both men and women. These waterproof, lightweight shoes are an excellent choice for anyone who enjoys outdoor activities. The upper part of this hiking shoe is made of leather and mesh that allows the shoes to breathe, while the leather helps keep the shoes waterproof. These shoes also feature the Keen Dry waterproof membrane, not just helping in keeping water out of the shoes, but also help let the sweat out. The outsole of the shoes is made of non-marking rubber, which enhances their flexibility, making them suitable for activities other than hiking or climbing, such as playing tennis or even jogging. The Keen Koven is also equipped with a removable EVA footbed, that is a good thing in this case because it apparently provides very little arch support. The biggest problem with this shoe is that they are not true to size and tend to run small maybe half a size, so we would suggest that you go a size up when you order them. It also has a lace loop on the heel, so they are very easy to slip on and off. The stretchable laces will also save you some time while putting these on since they remove all the hassle of tying and untying laces. The Keen Koven shoes are versatile in nature, and this might save you some money in the long run. They are so lightweight that you can wear them for tennis, or even for some light jogging in the rain. 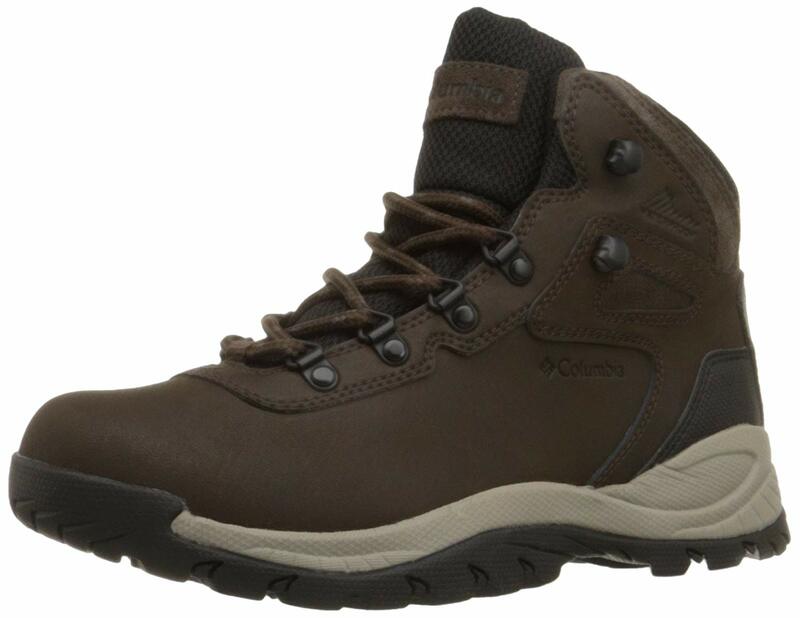 Keep your feet completely dry in the rain when hiking with the Columbia Women’s Newton Ridge Plus Hiking Boot. It is made of full grain leather which is treated with the Omni shield waterproofing that keeps moisture out and also making this boot resistant to staining. The lugged outsole also gives excellent grip and traction. This, in turn, makes the pair more durable and keeping them looking newer for longer. The midsole is compression molded of EVA foam for a lighter boot that reduces leg fatigue on longer hikes and your ankles and calves will be well-protected from any kinds of twists and turns on uneven terrain and rocks. The lacing system is triangular D-ring and clamshell that is sturdy and attractive. These shoes also have a size issue, i.e. you will have to order a size upwards in order to get the perfect fit. The 5.25-inch shaft offers high top style support and the durable rubber sole offers a good grip capability of the moderate degree to help in preventing accidental falls on moderately challenging walking trails. Some aspects of these boots are made from breathable nylon that adds to both the practicality and comfort of these boots. 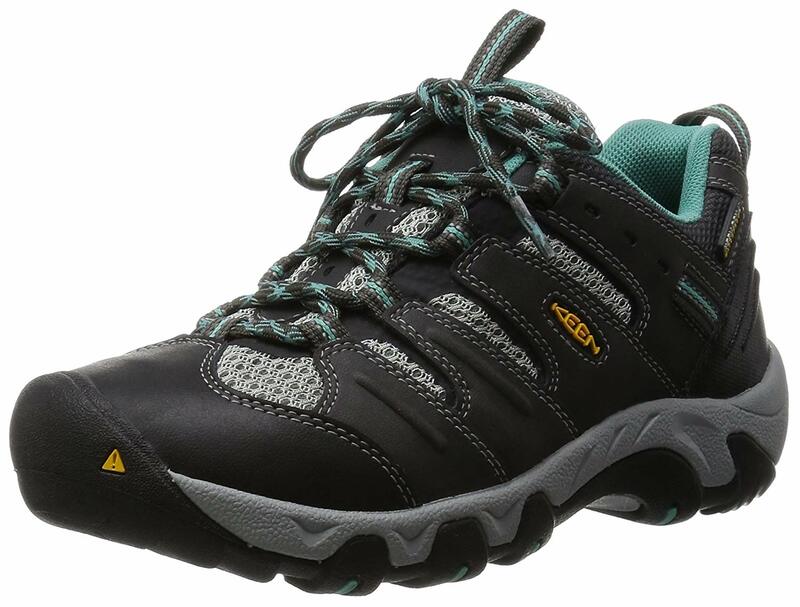 The Merell Women’s Moab waterproof hiking shoes are a lightweight, comfortable and durable option that also provides protection from wet conditions. The low-profile hiking shoe offers greater comfort on less challenging trails and not that suitable for longer hauls. The construction of the shoes is from the mixture of leather and mesh upper materials, that are the perfect combination for keeping water out and allowing the air to circulate throughout the shoe. This combination of suede leather and mesh also give this shoe light and natural feeling. There is extra padding in the heel that offers a surprising amount of trail isolation and underfoot protection. Padding is placed in the areas that most commonly become friction points. The addition of the air cushion construction makes this shoe comfortable for extended use. Basically, the hiking shoes are built keeping in mind the day hikers, and as a result, the shoe offers modest stability and support. The shoes are treated to resist water and keep the inside of the shoe completely dry and comfortable, making your trips easier and relaxing. 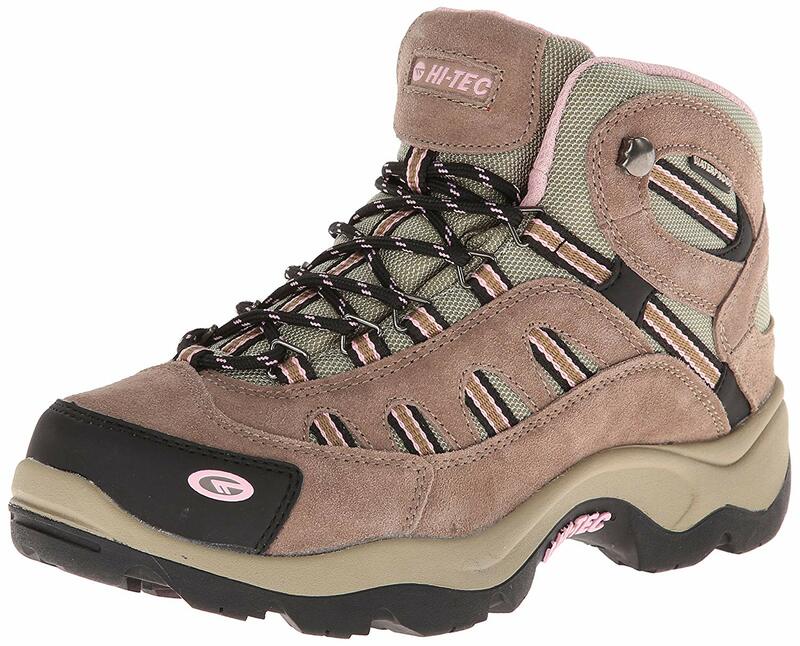 This quality shoe of Hi-Tec has an upper which utilizes waterproof suede leather in addition to its mesh and are a little different in appearance to your typical hiking boots that are available in dull shades of brown. These come in a range of fun pastel colors, so you do not need to give up style for practicality. The Hi-Tec Bandera hiking boots have uppers are a combination of suede leather and fabric, that renders them as both waterproof and breathable. The sole is carbon rubber, which increases the reliability of the boot in a variety of weather conditions. The rubber outsoles are a multi-directional traction rubber that gives excellent grip on most surfaces and in most conditions. The EVA sock liner is cushioned, contoured, and removable which means that you can wash or replace it with another if you have one which you prefer. 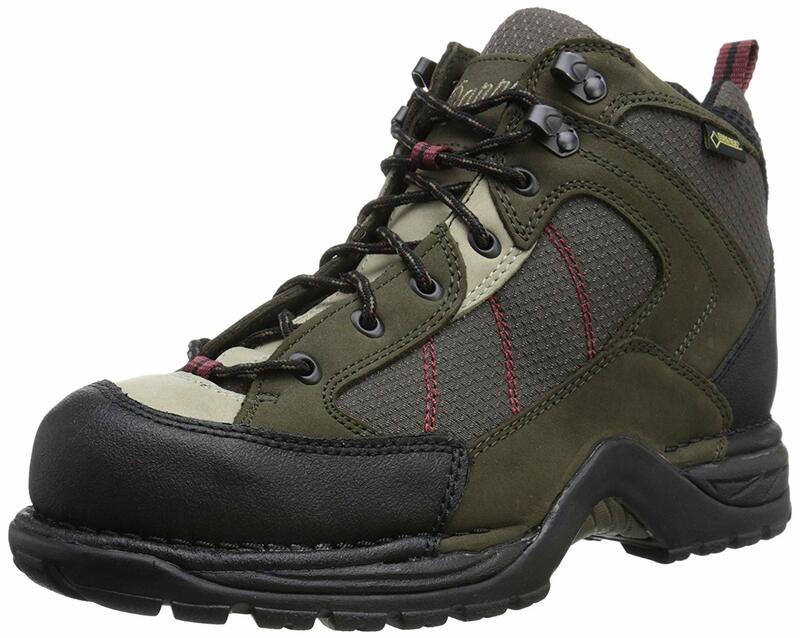 You can also get a secure fit in these hiking boots as they have a ghillie lacing system. This boot has a higher shaft than some of the others, measuring at 5 inches, which means you’ll have plenty of material to wrap around the ankle and keep it from turning or twisting. You won’t have to worry about slipping on a rock with these boots. Along with the material providing traction, there are air pockets for comfort and bounce. We would recommend you to use this boot when you are in light to mid hiking and when you hike on trails and tracks which are well-maintained. 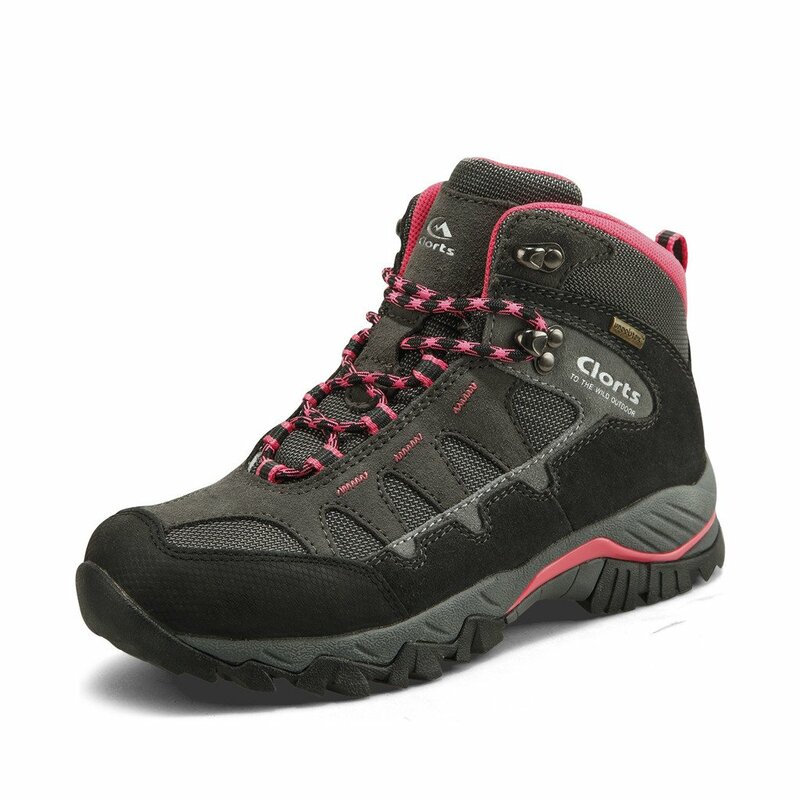 The Clorts women’s Mid waterproof hiking boots will keep you steady and confident on muddy, rocky and rugged terrain. 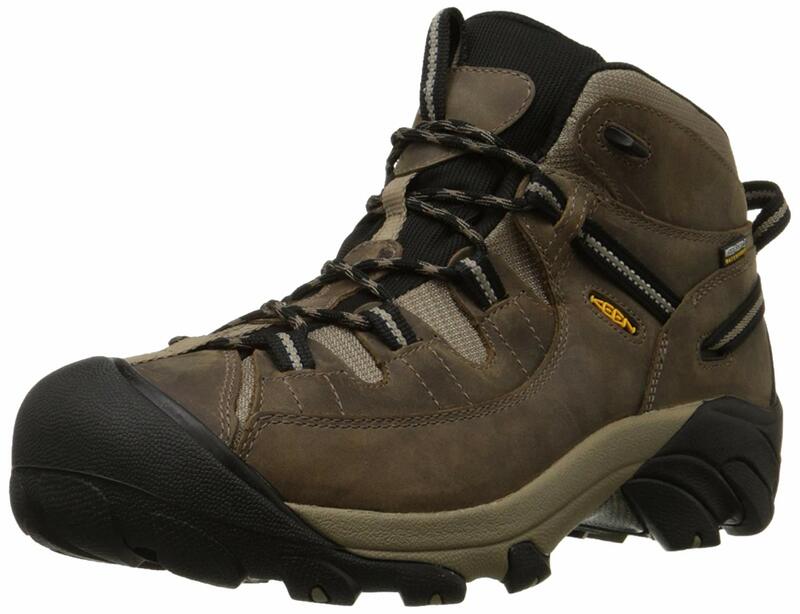 This waterproof boot provides you the protection that offers excellent ventilation for a comfortable hiking experience. The pair is made with breathable materials that allow airflow that prevents foot sweating. The combination of leather and mesh materials offer the maximum in breathability. The Uneebtex, waterproof membrane is fully waterproof to keep your feet dry when it’s rainy outside. The rubber toe cap protects your hiking boots from abrasions and scuffing. The suede, mesh and leather materials are durable, yet lightweight materials making this boot a more comfortable option for longer hikes. Unique Actifresh technology in the sanitized Clorts insole helps to block the formation of odor-causing bacteria for a fresher smelling boot after use. The Clorts Hike technology has been developed to keep your foot extra stable on challenging trails. The boots have a padded collar and tongue that offer additional comfort. The lace-up closure offers a secure and snug fit to the feet for a more comfortable and relaxing trip. The heel pull provides a comfortable and easy entry, making it easy to walk in. The pair also offers you with a removable dual-density sock liner that cushions the foot and puts a spring in your step. The EVA footbed provides stable comfort and which also features zonal arch and heel support. The Clorts hiking boots offer a steady structure for long distance endeavors. Now that we have listed the best hiking boots under 100, its time to consider the option that is best suited as per your requirements. 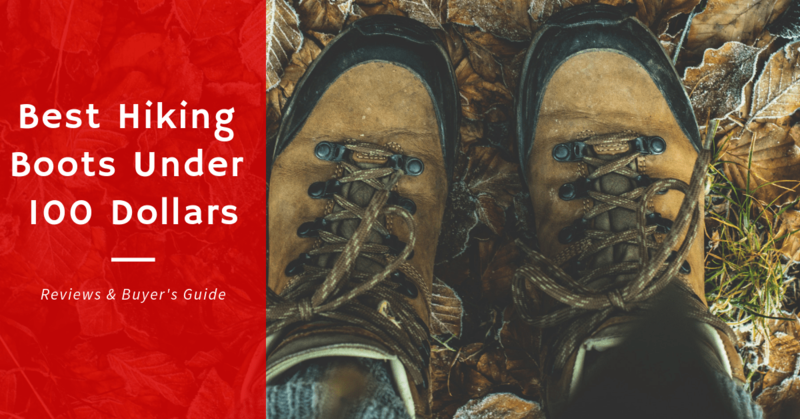 Consider the buyer’s guide before actually purchasing a pair of hiking boots. Narrow down the list of things you need in the perfect hiking shoe partner. The article will give you information about the features and advantages and disadvantages of every model of best Hiking boots so that you can take an informed decision.